Elaborating on our recent blog and looking at what’s trending in the cosmetic surgery industry, we see a rise in the amount of men opting for cosmetic procedures. There are obvious reasons for this: it is much more ‘out in the open’ these days – even many celebrities are being open about ‘work’ they’ve had done. And, following in the footsteps of women, it is a somewhat expected step for men who have taken more of an interest in the way they look and who perhaps frequent salons and spas for facials and various other treatments, eat well and work out regularly. This surge in the number of men seeking cosmetic treatments is typically between the ages of 30 and 70. Men too, it seems, wish to slow down the ageing process, and with ever increasing competition and pressures particularly in the work-place, where they are often competing in a younger job market, and on the dating scene of course – many are looking for that little extra ‘helping hand’. It will come as no surprise that just as women tend to opt for treatments to enhance themselves as women – accentuating/enhancing their curves, cheekbones and lips, men opt for enhancement of the parts of the body that fit classic masculine ideals, such as jawline, chest, abs and hair/hair line. 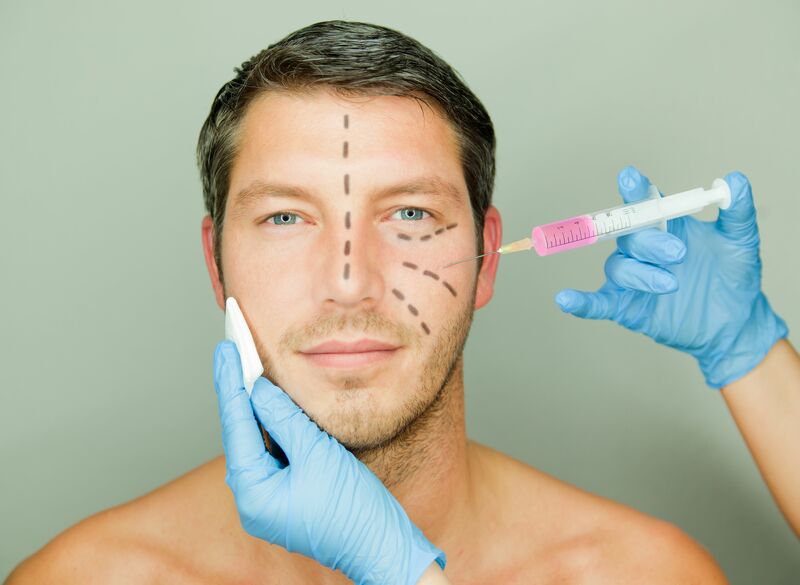 It’s true that men undergo fewer procedures as compared to women, and that will probably always be the case, but we are certainly seeing more men than ever before venturing into the world of cosmetic and aesthetic medicine/surgery. This surge amongst men is particularly evident in competitive sports and bodybuilding, where appearance, whether it be hair, face and/or body gives one the edge. Another factor here is the use of steroids for performance/image enhancement, which unfortunately often leads to physical consequences, as the hormones go haywire, such as an enlarged chest – a condition known as gynaecomastia, which will need corrective cosmetic surgery. It is interesting to see that chin, jawline and neck treatments are predicted to be the most requested for men in 2016 which is the same for women. Perhaps this is due to new advancements in these areas meaning that there are more minimally invasive treatments on offer with less downtime and scarring. There appears to be an increased awareness of the neck recently, could this have anything to do with the ‘selfie’ craze? Here’s an amazing statistic for you: the American Society of Plastic Surgeons (ASPS) has seen a 273 percent increase in the number of procedures performed on men since 1997! As for the factors that may make men think twice these tend to be related to potential side effects rather than what their wives or partners may think; often it’s their wives who have sent them in in the first place! Women on the other hand tend to be more apprehensive about what others think and will sometimes not even tell their significant other. Men, like women, who have recently been through a divorce or break up often look to cosmetic procedures for obvious reasons. Then there are men who are in their 30s-60s who simply want to look younger and healthier, which could be for social and/or professional reasons. Another common time is just before getting married, and even – particularly in America – the father of the bride who wants to look good for the big day and this is often factored in to the overall wedding budget. If you are a man considering cosmetic surgery, talk to us today and book in for a free consultation.